I recently received an invitation from Beverley Pierson the project officer of leave no trace Ireland to attend a workshop on the management of outdoor events which was held at the new official centre for leave no trace Ireland, Kilfinane O.E.C. on the 4th May. Many of you may have recently read the article in the spring issue of the mountain log by Helen Lawless the access and conservation officer regarding organised events in the mountains and the marked increase in the number of festivals, fundraising and challenge events. Attendees included such groups as Mountain Meitheal, S.E.M.R.A and cycle Ireland. The workshop started at 10:30am with tea and coffee and time to meet others. The first presentation was the Mountaineering Irelands running events policy which was given by Helen Lawless. Helen went over the current MI policy and explained why this policy is currently being reviewed. This was followed Carol Ryan of Coillte / Dublin Mountains Partnerships discussing the process of holding events and the correct procedures to follow in getting these events up and running. Then a presentation was given by Jim Flynn and Fergal Somers on the events which have been carried out by the Ballyhoura Development who run such organised events as the Ballyhoura walking festival and the Ballyhoura beast among many others. Lastly Matthew Bushby from The Mournes Heritage Trust gave a talk regarding the Mournes Event Strategy. Finally we all participated in a practical workshop to see how we could incorporate Leave no trace into organised events. I came away from the workshop with a far greater knowledge of how large events and groups can have an effect on our environment and how it is up to all of us going into the mountains to do our part. We all have a duty of care to the mountains. We all gain so much from the benefits of hillwalking that sometimes it is nice to put a little something back, whether it is picking up a plastic bottle passed along the way, educating new members that it is not alright to throw banana skins or teabags on the floor, or considering a leave no trace workshop! Some ways in which we can do our part is to follow the seven principles of the Leave no trace ethic. Join a mountain meitheal group for the day and volunteer your services, plan and organise a clean up day with the club in an area used frequently. 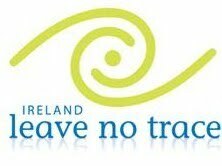 For any information on the Leave no trace ethics, Mountain meitheal or if any members would even be interested in becoming Leave no trace trainers please contact myself at juliereeveswalking@gmail.com or for further information follow the links below.